Though large commercial trucks and passenger vehicles are expected to share the road safely, serious collisions often occur. When they happen, it's usually the passenger vehicle driver and occupants who bear the brunt of injuries and damages. That's because smaller vehicles are grossly outmatched by massive big rigs, 18-wheelers, semis, tractor-trailers, and other large trucks, which can weigh up to 80,000 pounds when fully loaded with cargo. Commercial truck drivers and trucking companies are required to comply with cargo securement rules imposed by the Federal Motor Carrier Safety Administration (FMCSA), which regulates interstate trucking in the U.S. When drivers or other trucking company workers fail to abide by the FMCSA's loading and securement requirements, truck cargo can shift dangerously during transit, potentially causing the driver to lose control of the rig and cause an accident. Victims injured in accidents caused by negligence of a commercial driver, trucking company, or freight handler, may be entitled to compensation. This financial recovery might potentially cover economic and non-economic damages, such as crash-related medical expenses, property damages, lost wages, loss of income, pain and suffering, and mental anguish. 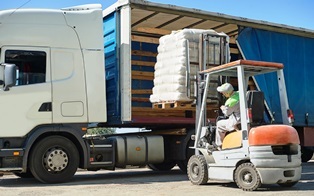 If you were hurt in a truck accident caused by improperly-loaded cargo, working with an experienced attorney can help ensure you receive fair compensation for injuries and other losses. The seasoned personal injury attorneys with Van Sant Law help countless Georgia truck accident victims understand their rights and fight for the proper financial recovery they need. We're eager to assist with your case. Contact us today to schedule an appointment for a free initial case consultation.